15/01/2015 - Austria should set a timeframe to increase its aid budget in line with a pledge to allocate 0.7% of its gross national income (GNI) to development aid, according to an OECD Review. Austria has stabilised its aid budget since a sharp drop in 2009 that was due largely to a fall in debt relief operations. However, it missed a target to raise its official development assistance to 0.51% of GNI in 2010 and its ODA stood at 0.28% of GNI in 2013, despite a 2.6% rise in aid spending to EUR 882 million. In its latest Peer Review of Austria, the OECD’s Development Assistance Committee (DAC) found that Austria has not implemented three key recommendations made in a 2009 Review, though it has partially or fully implemented 12 others. Austria has made progress in aid evaluation, creating an independent evaluation unit and monitoring system, it said. The DAC said Austria should cease a practice of including debt relief in its ODA forecasts before the sums had been agreed by the Paris Club as this risked inflating projections. It called on Austria to reverse a decline in the share of aid sent to least-developed countries. Austria allocated aid worth 0.06% of its GNI to least-developed countries in 2012 - just over a fifth of its aid budget - compared to a UN target of 0.15%. The top recipient countries of Austrian aid are Côte d’Ivoire, Turkey, Bosnia and Herzegovina, China, Togo and Ukraine. The DAC praised Austria for raising substantial amounts of non-ODA development funds since 2009 through the small but fast-growing Austrian Development Bank and it encouraged the Austrian Development Agency to deepen its partnership with the bank. 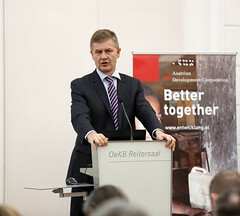 It said Austria could do more, however, to improve co-ordination between different bodies working in developing countries. Each DAC member is reviewed every 4-5 years as a way to monitor its performance, hold it accountable for past commitments and recommend improvements. A review uses input from officials in the country being reviewed as well as civil society, the private sector and other donors in recipient countries. Read more about DAC Peer Reviews. The Austria Review is available at: www.oecd.org/dac/peer-reviews/peer-review-austria.htm. Findings and recommendations are available here.